There’s nobody resistant to an accident, even motorcycle riders can be involved in an accident. With many violating the driving laws, it doesn’t matter how careful you are, one careless road user can knock you off your bike. 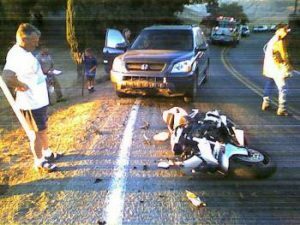 If you are involved in a motorcycle accident and willing to let a motorcycle accident attorney help you get compensated, then you should come to us at Rawa Law Group. We are a first-class legal firm that has over the years, stood by injured victims of motorcycle accidents and have given them the needed legal presence to make accident claims and see to it that they receive full payment. We are proud to say that we have some of the best accident attorneys in all of California and we have amassed more than 55 years of combined experience in the business. At Rawa Law Group, we hold our clients in high esteem as we keep them informed in their case from the start to the finish. When you hire our services, you do not have to be bothered about upfront costs. We offer free case evaluation and only receive payment from you after winning your case. We also offer very flexible appointment times and we can dispatch one of our most reliable attorneys to make visits to your house or hospital of treatment. Because we care much about you, we dish out sound legal advice without any hidden charges. If you want to hire a reliable motorcycle accident Moreno Valley, CA, why not take advantage of our incentives and contact us at the below address.